I’m going to start a page for each of my instruments detailing what it does and giving some details of what it gets used for. I’m going to start with our Shimadzu LC20 series High Pressure Liquid Chromatograph [HPLC]. HPLC is my favourite analytical technique and I have more than 10yrs experience getting results from it. The system is comprised of a quaternary LC pump with integrated degassing; high speed, flushed-path, total-volume sample injection, thermostatted autosampler for up to 70 samples; a venerable Jones Chromatography column heater (HOT! ); a twin wavelength UV-visible absorbance detector and a fluorescence detector. The system is connected to a PC running LC Solution. The autosampler and degassing unit were both new this year, replacing functional but less capable units which have been transferred to a secondary system. 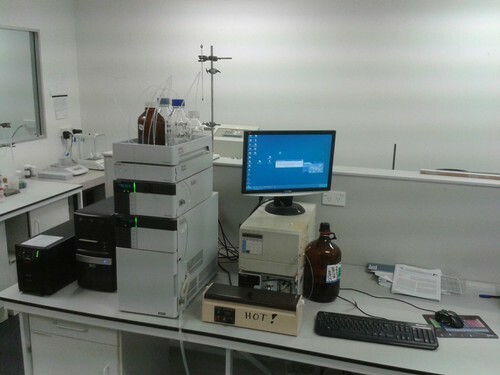 We now have the ability to run two separate HPLC systems fully automatically. The cutting edge of HPLC technology has moved beyond systems like this one to Ultra-High Pressure Liquid Chromatography (UPLC). However, its great to have a sturdy and capable workhorse system like this one for the more straightforward bits of analysis.